Combining a dictionary and a thesaurus in a single volume, this book offers readers a convenient way to examine dictionary entries and research corresponding synonyms at the same time. The split-page design displays full dictionary entries on the upper portion of each page and full thesaurus entries on the bottom portion, which makes finding and understanding the right word easier than ever. The thesaurus section of the page is screened to highlight the dual nature of the book, providing quick access to the synonyms that relate to the dictionary entries above. The dictionary contains 70,000 entries, and the thesaurus contains 150,000 synonyms that are alphabetically arranged on each page to correlate with the dictionary entries on the same page. 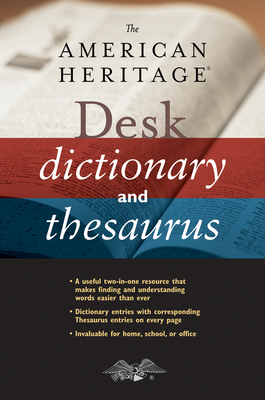 With its unique format and user-friendly features, The American Heritage® Desk Dictionary and Thesaurus is a convenient and invaluable resource on words.